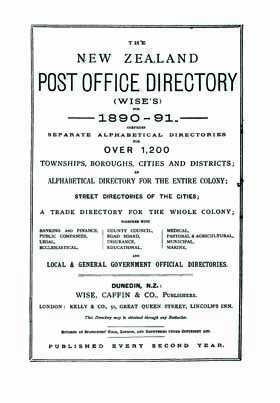 These Wise directories are a valuable genealogy resource for anyone exploring their family history or building a family tree, as well as researchers of New Zealand history. They contain towns, alphabetical, trade and miscellaneous sections that list the names, addresses and professions of every one in New Zealand. It also includes a street guide for some of the major towns and separate directories for banking, public companies, medical, legal, ecclesiastical, educational, pastoral, municipal and government. Included in this collection are five volumes: 1890, 1892-1902, 1905, 1915 & 1930-1933.